Caroline Russell AM has condemned the Government’s decision to select Heathrow Airport as the preferred choice for expansion. She has also renewed her appeal to the Mayor of London to get behind policies that would make better use of existing air and international rail capacity. 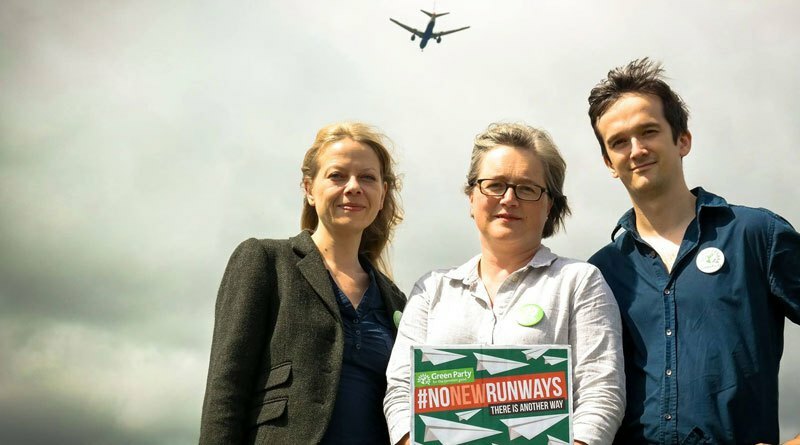 Supporters of Heathrow expansion claim a third runway could be completed without air quality legal limits being breached. However, opponents reject suggestions that anticipated future reductions in air pollution from cleaner vehicles could allow an expanded Heathrow airport to emit more pollution than at present and stay within legal limits. In May, Caroline questioned the Mayor on airport expansion. He said he was ‘not persuaded further expansion of airports within London would be compatible with (my) aim of achieving legal limits for air quality as soon as possible’. “The decision to choose Heathrow as the preferred option, depending on the final vote next year, has offered temporary relief for the people living under the new flight paths but prolonged their anguish as they wait another twelve months to find out their fate. “Imagine a motorbike zooming outside your front door from morning to night – this will be the new reality for west Londoners who will be blighted by more air pollution and intrusive noise because of this miserable decision. “This is a two-pronged problem for west Londoners, as well as contending with noisy flights their local roads and public transport will be clogged with increased traffic, worsening their daily journeys and exacerbating air pollution. “There’s no way expansion should even be on the table when air pollution in Heathrow already exceeds legal limits. This is a bad decision that will accelerate climate change and makes a mockery of the Government’s announcement to ratify the Paris Agreement on climate change. “I am calling on the Mayor to influence the Government to make sure alternatives to yet more expansion are explored; annually there are around 10 million seats of unused capacity on the Eurostar and a frequent flyer levy could help use existing runways more efficiently. “The Mayor should, for example, convince the Government to renegotiate the current Eurotunnel fee structure that means both trains and passengers pay arbitrary fees and makes international train travel so expensive. “Transport for London estimates that £18 billion of investment will be needed to upgrade the transport infrastructure around an expanded Heathrow with just £1 billion coming from Heathrow.